This is the kind of party that only academics might enjoy, professors in a graduate faculty at that. Despite the numerous bon mots and the writer-director’s attempts to have the ensemble cast show their fangs, as a locus for the release of emotional tensions this film cannot begin to compare with the king of the circuit, Edward Albee’s “Who’s Afraid of Virginia Woolf.” We may have a case of a viewer’s preference for a more American style of browbeating, which I offer by way of declaimer. The chatter of this strange assortment of upper-middle class Brits might work better in the theater, since the action takes place in real time set wholly in an extensively furnished London home (actually filmed in a West London studio), with the women doing most of the talk and much of the witty liftings. The dull and conventional ambiance here is a surprise given that Sally Potter has previous contributed “Orlando,” with the great Tilda Swinton performing in the role of a nobleman who stays forever young and moves through periods of British history, thereby giving the film a broad canvas on which to paint differences in centuries. Nor does “The Party” stand up to Potter’s “The Tango Lesson,” which finds Sally taught to dance by Pablo, forming a bond which later breaks when the two find that they want different things in a relationship. Like the duo in “The Tango Lesson,” an ensemble of people who presumably were friends discover that maybe they don’t belong together, considering the barbs that emerge when some of the attendees discover what they must have barely suspected. 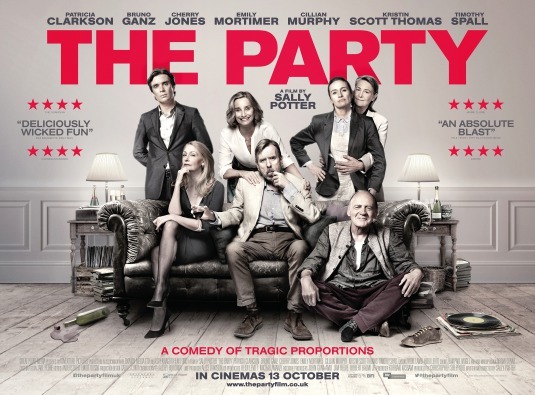 With soundtrack music at a minimum and black-and-white photography giving a more intimate feel for the occasion, Janet (Kristin Scott Thomas) invites pals to a night of talk as she celebrates her promotion to British Health Minister by an opposition party. Her hirsute husband Bill (Timothy Spall) seems comatose, having sat in a chair with wide eyes nursing a glass of red wine but otherwise keeping his body still. The most entertaining guest (a low hurdle), Gottfried (Bruno Ganz), performs in the role of an aromatherapist, lecturing the group about the body’s capacity to heal itself without medicine and praising doctors who prescribe placebos to help further the cure. As April (Patricia Clarkson), once a leftist but now cynical about everything makes generic statements about civilization while Jinny (Emily Mortimer), pregnant with three triplets presumably not based on her lesbian relationship with Martha (Cherry Jones). Completing the ensemble, banker Tom (Cillian Murphy) is the most agitated of all not necessarily because he snorts a line in the hostess’ lavatory and packs a gun on his shoulder. Secrets emerge: terminal illness meets extramarital affairs, the whole episode designed also to make points about the inability of establishment politicians to make real change and the changing nature of the women’s rights movement. The majority of critics so far appear to believe that humor can indeed travel well across the Atlantic, but to that concept I’ll have to join the loyal opposition.